After you receive your new account email, you will need to authorize your QuickBook Online company file. 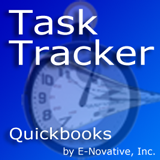 TaskTrackerPro for Windows connects the Task Tracker desktop application with your QuickBooks back in the office using a cloud-based web service. Your email address and a password is required to synchronize the application with the web service, and the web service to your QuickBooks company file via the "web connector." If you are using QuickBooks Desktop edition, a unique Web Connector file will be created especially for your QuickBooks and Application and emailed to you. If you are using QuickBooks online edition, you will need to Authorize TaskTracker to connect to your Quickbooks company file online. If you are already registered, then your Web Connection file will be email to you automatically after you register again. Or, you can sign in to your account and click on "Manage My Account" to download stuff.